Super Mario Odyssey is a 3D platform game developed for Nintendo Switch and another installment of the Mario video game franchise. Super Mario Odyssey for SWITCH is a 3D platform game developed by Nintendo, creators of all the previous installments of the series. According to the series’ tradition, we play as the plumber named Mario who has to save his beloved Princess Peach. This time, she faces a forced marriage with Bowser, the series’ main antagonist. The plot, however, is not that important and only serves as an excuse for our adventures. What is interesting is the fact that in Super Mario Odyssey for SWITCH we explore not only the fairy-tale Mushroom Kingdom, but also an alternate world inspired by the real one. In terms of mechanics, gameplay in Super Mario Odyssey for SWITCH is an evolution of what we could see in the previous games of the series. 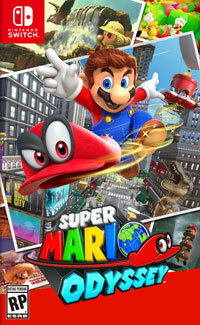 We get a 3D platformer where we explore various locations using Mario's acrobatic abilities, gather items, avoid traps, and fight with the encountered enemies by jumping on their heads. From time to time we will have to face powerful bosses. There are, however, some new things that were introduced in Super Mario Odyssey. As we play, we explore many different levels like cities, desters, villages, and forests. Maps are now much bigger and sandbox-like, giving us more freedom of exploration. Our plumber’s hat is now also an interesting thing. It is a living character that gives us access to special abilities, i.e. Mario can throw it and it will hang in the air, creating an additional platform to land on and jump from to beat a distance that would normally be too much for our plumber. Game score 8.595 / 10 calculated out of 558 players' votes. Expectations before the premiere: 7.1 / 10 calculated out of 137 players' votes.